​Getting on the water with a friend or a family member can be fun but sometimes you might want to go it alone. You may be considering a tandem kayak but are they any good when you’re on your own? The Old Town Twin Heron may just be able to offer the best of both worlds. To find out if it’s got what it takes, we’ve analyzed its main features and have also taken a look at the angler version. ​How Would A Twin Heron Kayak Help Me? 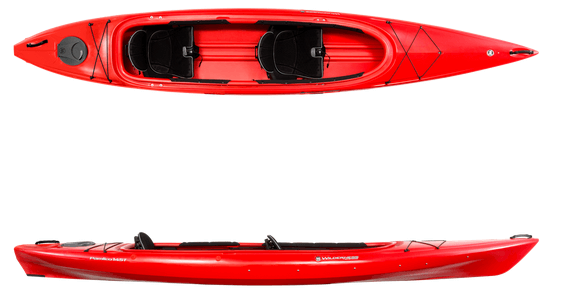 A tandem kayak can let you get out on the water with a second paddler. This can be ideal for families looking to take kids out but can also be a good choice for couples or friends who want to enjoy the outdoors together. With the Twin Heron you have the option of paddling solo. This can make it more practical than some tandems, which may require two paddlers to maneuver it or at least a reconfiguration of the seating. It’s a sit-inside vessel with a large cockpit, which can help you to feel less confined. There’s plenty of space on this yak, so it could be a great choice for camping trips or if you want to take your dogs along for ride. The Twin Heron Angler might be better suited to you if you plan to fish, as it’s built with the same design as the standard version but has rod holders mounted along the sides. ​The Old Town Twin Heron is a tandem sit-inside kayak that can be paddled either by one or two people, with the solo paddler seated in the stern seat. Both the standard Twin Heron and the Angler version come with two seats and the Angler has the added advantage of built-in rod holders. One feature of this yak is the Auto Trim hull. This is designed to redistribute the weight in the bow when there is only one person paddling in the rear, so it shouldn’t tip up at the front when solo paddling. Because of this feature it means that you don’t need to move the seats around. Plus, the front seat can be completely removed for this purpose. The hull is also stable on calm bays, lakes and rivers, which could be more appealing to beginners and similarly if you want to fish or take photos. Space in the cockpit has been maximized on this yak, creating a seating area that can be comfortable for longer trips. Even with two paddlers on board there’s room for a couple of small dogs or some camping gear. With the front seat removed, the space is instantly increased to accommodate more gear or fishing equipment. As well as this, there is also the deck bungee rigging at the stern, allowing you to secure additional gear. The two seats included with both the standard and angler versions are the Comfort Flex seats. These seats are padded both on the bottom and the back and the angle of the seat back can also be adjusted for additional comfort. To help you gain a more comfortable paddling position there are adjustable foot braces for both paddlers. These simply slide on a track so you can easily find the correct position for your leg length. There are also cup holders so you and your paddling partner can stay hydrated, and there are paddle holders on either side. The Angler has the added feature of built-in rod holders so you can load up the yak for a day’s fishing. There are six Cannon rod mount receivers on the deck as well as two Cannon rod holders. If you’d like more speed from your tandem the Pamlico 145T might be a good alternative. It’s a 14 foot 6 inch sit-inside with a rounded hull for speed and can also be paddled solo. It has good storage, including a hatch and comes with two seats. The Yellowfin 130T is a 13 foot tandem sit-on-top that can accommodate three people and can be paddled solo. It features rod holders and mounting points and has two storage hatches. It also comes with two Hero seats and two paddles. The Malibu Two is a 12 foot, recreational sit-on-top that might be ideal for warm weather paddling with the family. It has room for three people and can be paddled solo from the center seat. It comes with two padded seats and straps to secure gear. The Twin Heron can be a great choice if you’re looking for a spacious kayak that can offer you both tandem and solo paddling. It’s stable, easy to paddle and ideal for family days out. The Angler can also provide you with the rod holders you’ll need for your next fishing adventure. If you think it’s the right one for you, check out the Twin Heron here and if you’d prefer the rod holders, check out the Angler version. ​Can you stand in the Twin Heron while fishing? ​It’s not designed for standing but if you have good balance you might be able to stand. ​Can one person use this kayak? ​Yes, from the rear seat. ​Does it come with paddles? ​No, you would need to purchase paddles separately. ​Are the seats adjustable or removable? ​The seat backs are adjustable and the front seat is removable. ​​Is there any dry storage?